First off, things have been slow here at the Tavern, and that probably is more our (the writers) fault than anything. There’s been a flurry of news, with European based players returning to their respective clubs, the two K League rounds I haven’t mentioned as well as some news from the national teams. I’ll hopefully get to recap the K League Round 22 later, but let’s delve into the news from the past week on all other fronts. 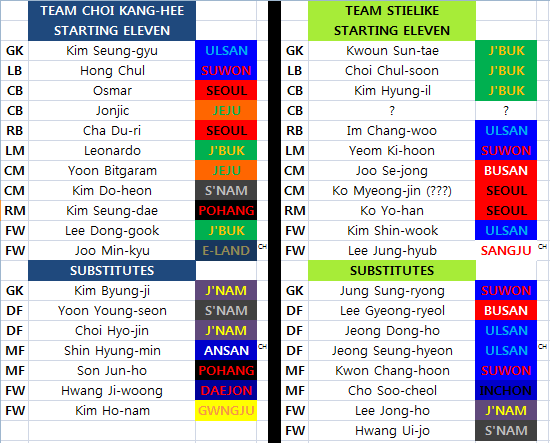 Well, although I’ll recap the 22nd round of the K League Classic in my next post, it’s worth mentioning the depressing amount of transfers the K League is having to deal with in this transfer window. North Korean international Jong Taese transfering to Shimizu S-Pulse. The Zainichi Korean returning to Japan to play for a club offering quite a lot of money compared to the Suwon club. However, that might not be where this story ends. In his last press conference in Korea, Jong mentioned how he felt like he never really fit in the South because people called him “a red communist” and slurs of the like. Now, although that might not be the sole, unique and principal reason why Jong has elected to head to the J.League, it certainly doesn’t help in keeping North Korea’s best star playing in the South Korean league. After only scoring one goal in 17 appearances for Jeonbuk on his second stint with the Jeollabukdo club, 34 year-old Brazilian Eninho Junior said his farewell to the Jeonbuk faithful. However, it wasn’t because Eninho wanted to leave that he departed. He was asked to leave by the club’s administration to clear up a foreign player space (and probably some money as well). The club legend, who made 139 appearances in total for the club from 2009-2013 & 2015, graciously accepted, taking responsibility for his poor performances. That’s Edu. The K League’s current top scorer and Jeonbuk legend. Former Schalke 04 player. Signed only for Jeonbuk this January, and then he’s gone like the wind in July. The club he’s going to isn’t a formidable one – in fact, Edu has transfered to a Chinese second division outfit. So why? Although Edu claims it’s about family (because he has family near China? Umm? ), it’s probably more about money. Edu was making an impressive 1.5 billion won at Jeonbuk (about 1.3 million dollars USD), but Hebei China Fortune reportedly (according to the Joongang Ilbo) offered close to 4.5 billion won for Edu as well as a transfer fee around 3 billion won. This is a massive sum of money for any K League club that certainly had Jeonbuk in a dilemma – take the cash or keep the player? Ultimately, Jeonbuk opted to take the cash, as did Edu, and one of the K League’s best stars left to play in the Second Division of the Chinese League. That’s kind of sad. Jeonbuk are looking into signing 34 year-old Brazilian attacking midfielder Luiz Enrique (no, not the Barcelona manager). He previously made 63 apperances for the club and currently plays for Emirates Club in the Arabian Gulf League. Ulsan Hyundai have signed Croatian forward Ivan Kovacec. The 6’2” forward has played most of his career in Austria. Ulsan Hyundai also released Brazilian midfielder Tarta. But this speaks to a broader problem. Why are the K League’s top players being so easily lured away? Why are they heading to the money-kind of “greener pastures”? How can Jeonbuk and Suwon, both owned by massive conglomerates (Hyundai and Samsung) lose their best attacking players to the worst team in the J.League (and we have clearly seen that the K League > J.League when it comes to direct competition) and a 2nd tier Chinese side? How are these two massive companies being outspent by other, fairly random East Asian sides? It’s quite clear, to me, that chaebols and local governments simply don’t seem to make a sizable profit off of K League clubs. As a result, K League clubs don’t see much of a need to invest too much cash into their club. It can serve as a nice advertisement, but that’s it. It certainly doesn’t help that the K League forces clubs to publish player’s salaries. Current Jeonbuk manager Choi Kanghee claims that this “exodus” of sorts was certainly predictable because of the K League’s policy. And he might not be entirely wrong. Although you can’t really do much if you’re Jeonbuk and there’s some club offering to triple your player’s salary and give you a huge transfer fee, I’m speaking more to the players getting offered handsome sums of cash, but not an amount that’s exponential to their current salary. When you’re a random Chinese club with money to spend, and you delve into the Korean market looking for a solid player, it certainly is beneficial to you when you see that a player is making “this amount of money” for “this many years”. All you have to do is be convincing, offer “this amount of money + 1” and you’ve got a great shot at getting yourself a deal. But the solution isn’t as simple as reversing this policy. Although that might make things slightly more difficult for foreign clubs to buy decent K League players, it doesn’t solve the fact that Japanese, and to a bigger extent, Chinese and Middle Eastern clubs seemingly will always have more cash to spend and better players to buy than the K League seemingly ever will. Is there a solution to this? I’m not entirely convinced you can make a conglomerate spend more money on a club. And I seriously wonder whether or not the time has come to simply accept the following : that the K League is, in certain respects, and on the surface only, alike to Southampton. Bear with me. Southampton has been producing talent such as Bale, Clyne, Shaw and Schneiderlin. Really good players who, if kept at the club, could turn Southampton not only into Premier League contenders, but world-beaters. However, Southampton always end up, without too much thought, selling their players to the big boys of the Premier League. They are content with collecting their transfer fee, stuffing it into the back pocket and repeating that cycle until their piggybanks burst. Perhaps it’s time the K League accepts this as well. That other East Asian and Middle Eastern clubs will always outspend us. That it will be extremely difficult to hold onto our top stars when other clubs come calling with hundreds of thousands of dollars to spend. Maybe it’s time that the K League resolves itself to this fact, and instead focuses on an extremely important aspect of the success to any countries’ footballing system – focus on youth. There were positive steps in the K League this year, when a rule was made that every team’s starting 11 needed to contain a U-23 player. This rule is working. It’s giving players like Moon Sangyoon, Kwon Changhoon and Moon Changjin a chance. They are developing their game on Korea’s shores and improving drastically. Perhaps it’s time that K League clubs take their own initiative, and follow the lead of teams such as Daejeon. The Citizen’s XI regularly featured 20-year old Seo Myungwon, and of late, breakout star 19 year-old Hwang Inbeom. Just look at what the startlet box-to-box(ish) midfielder was able to achieve in just 33 minutes against Jeonnam. Unfortunately, and unbelievably frustratingly, Hwang suffered a season-ending injury in that game. But his skills and thrills are, for me, a testament to the young talented players our K League is able to produce. If Korean clubs and K League fans accept that 1) the cream of the crop will always leave and that 2) instead of worrying too much about that, focusing instead on giving youth a chance, then I believe it’s for the greater good of our K League and of our national team. Korean Players Abroad are back training with their clubs. Reports that Park Jungbin (SC Karlshurer) is on his way out. final bit of news: Busan I’Park manager Yoon Sunghyo has been sacked. Busan are currently in 11th place. The All-Star Game will be held on July 17th at 7pm from the Ansan Wa~ Stadium. It will be broadcast on KBS2. almost forgot: Stielike has announced his 50-man preliminary roster for the EAFF Cup. Notable absentees: Son Junho, Kwoun Suntae, Jung Sungryong and Park Chuyoung.